This Saturday we will have the Unite for Europe march in London, we are all hoping it will be enormous! 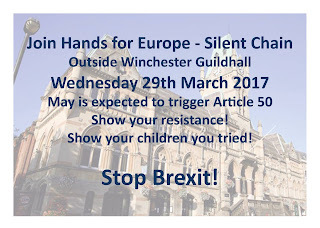 We have a group of people going from Winchester by coach (organised by the European Movement Hampshire) and many others will make their way by train or car. Please come along if you can make it - and if you don't want to go on your own, contact us! If you are planning to go by train then it's useful to know that South West Trains still have a ticket promotion going that gets you into London for £14 for a single journey, but these tickets need to be bought before the day of travel. The unfortunate news is that there will be engineering works on the route to Waterloo, so it takes longer than normal. There are two official joining points for the march, one is at 11am at Park Lane, the other at 12noon at Trafalgar Square - but of course you can join at any point of the march whenever you arrive! For more details, please see the info on the march's event page on Facebook. [Updated!] We have been told that 29 March will be the day when Theresa May will trigger Article 50. 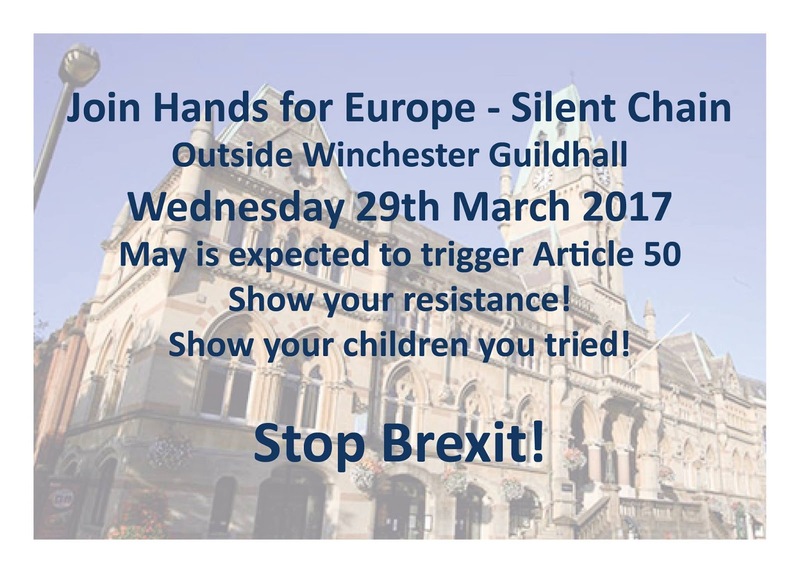 There is an initiative going to organise local action to show our disagreement with this - we will gather to stand in silent protest in front of the Guildhall at 6pm. If this would appeal to you, please don't hesitate to join in. There is more info about the idea in the new Join Hands For Europe Facebook group. If you would like to help, you can contact us via this website or join the The 48% - Winchester Facebook group to discuss.